The interception of a U.S. reconnaissance aircraft over the Black Sea by a Russian fighter jet has been labeled as ‘unsafe and unprofessional’ by American defense officials – charges that have been dismissed by Russia. 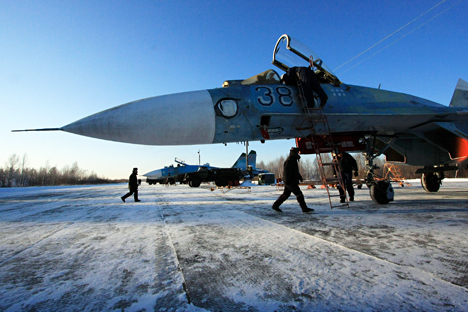 U.S. defense officials have said that a Russian Su-27 fighter plane came dangerously close to an American RC-135 reconnaissance jet they said was on a routine flight over the Black Sea in late January. "On January 25, 2016, a U.S. RC-135U flying a routine route in international airspace over the Black Sea was intercepted by a Russian Su-27 in an unsafe and unprofessional manner," the online newspaper Washington Free Beacon cited Spokesman of the U.S. European Command Captain Daniel Hernandez as saying. Military officials say that the Russian jet came within 20 feet of the American plane before banking away. The Russian side, however, does not agree with the Americans' evaluation. "An intercept is an intercept. They do not have the right to judge its professionalism," said former commander of the 4th Air Defense Army and Hero of Russia Lieutenant General Valery Gorbenko. "And no one actually intercepted it. It appeared above those waters, our plane took off and had a look to see if it was a military plane or not. Realizing it was a reconnaissance aircraft that didn't intend to enter our air space, our plane turned around and went back. There's nothing special about this," he said. What was the American reconnaissance plane looking for? The RC-135 is a modernized military modification of the Boeing 707, which can be adapted for collecting several types of intelligence, including photo, nuclear monitoring and electronic espionage. "It was gathering intelligence on our radars," said Gorbenko. "In Crimea and the Black Sea coast we have our air defense systems. We also gather intelligence on such facilities. At least this is what I was responsible for when I was commander." "The RC-135 has a multitude of various antennas," explained test pilot and Hero of Russia Colonel Igor Malikov. "It can gather electronic intelligence, it has a side-scanning device, its radar has a clear picture of the entire territory, including cars moving along the streets." The last incident of the same nature occurred in April 2015 over the Baltic Sea. A Russian Su-27 fighter allegedly approached an American RC-135 reconnaissance plane in a dangerous manner. The U.S., as in other similar cases, accused the Russian plane of an unprofessional intercept. Citing Pentagon officials, the Washington Free Beacon online publication remarked that the Russian fighter had approached the American plane at a distance of 20 feet (about six meters). According to journalists, the RC-135's mission was unknown, but "its position allowed it to monitor Russian military activity in western Russia and in Kaliningrad." It is not the first time that NATO and the U.S. are complaining about the activity of Russian military planes. In January last year NATO Secretary General Jens Stoltenberg said that in 2014 the alliance's air force had intercepted Russian military planes more than 400 times –four times more than in the previous year. In November 2015 Supreme Allied Commander Europe of NATO American General Philip Breedlove stated that Russian air force activity had increased, adding that Russia was using a more complex combat system and more machines and was also flying its planes a bit further than usual. In October 2014 the Estonian Defense Forces General Staff stated that a Russian Il-20 reconnaissance plane had violated the country's airspace – a claim that was denied by the Russian Defense Ministry. In a later incident, the Latvian armed forces saw a Russian reconnaissance plane over the Baltic Sea. During the Ukrainian crisis the U.S. and other NATO countries made such announcements almost every week. Russian Deputy Defense Minister Anatoly Antonov noted that the flights of Russian strategic bombers beyond Russia's borders are a demonstration of the potential of the armed forces and a "normal practice that does not violate any agreement." Meanwhile, Russian Defense Minister Sergei Shoigu has promised that Russia's long-distance aviation will continue its flights throughout the world.